3D printed in PLA with handle painted. That's how the song goes, right? Well, in spirit at least. We're a multi-cultural household and I have a 3D printer I'll continually need to justify buying. 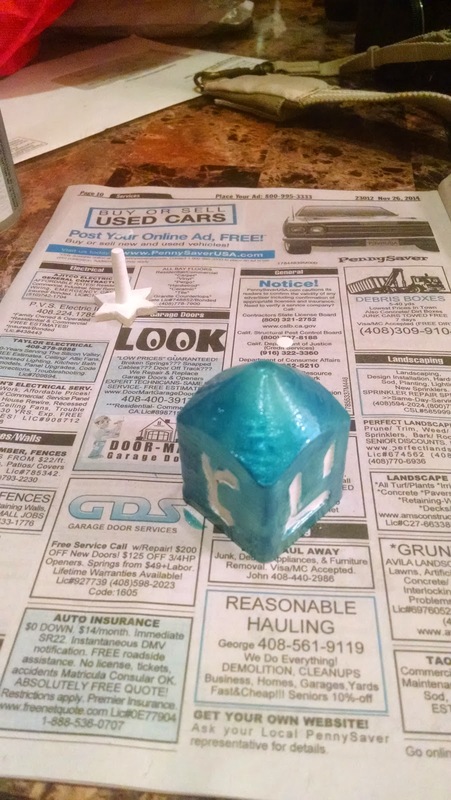 So, I decided to print a dreidel and see how I could do finishing it. 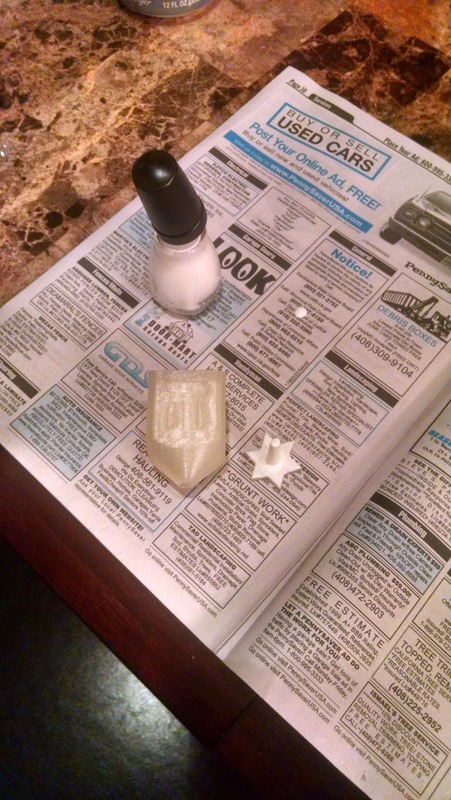 I'm working with 1.75mm Shaxon PLA in "natural" tone which is vaguely clear-ish. I'm using a Printrbot Simple Metal at .2mm for all layers using Reptier-Host Mac and the newest stable Slic3r. Right off the printer it was smooth and solid. 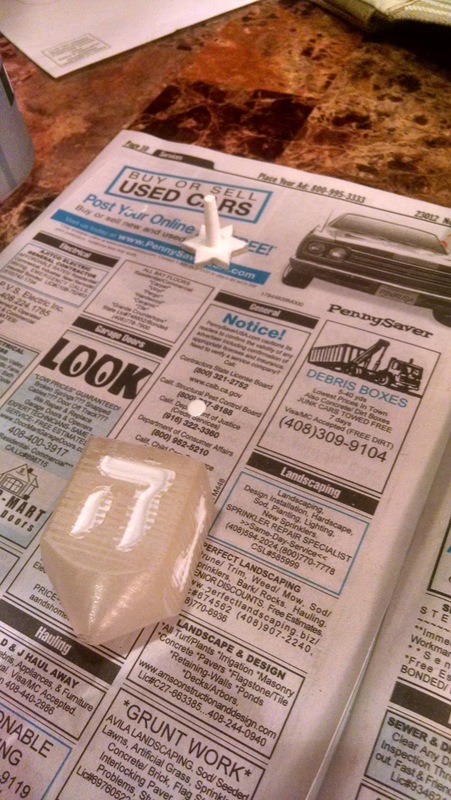 The handle did not fit into the socket on the top of the body so I first tried sanding the star of the handle. This did not progress quickly so I stepped up to small hand files. This was faster, but still pretty tedious so I pulled out the dremel. This! Was! Fast! I still had to finish with the files as even at low speed the dremel melts the plastic as much as it sands it. Some quick filing and the burrs were off and it had a nice fit that was tight enough to stay together through friction. It spins well too! A youtube video I saw suggested nail varnish (nail polish here in The States) for finishing prints. The idea is that it's viscous enough to fill in the ridges between layers. Also, it's intended to provide a durable finish. I thought it would be a good way to test out finishing without buying a lot of painting tools. As an aside, some of this was $2 for 0.5fl oz, some was $10.50 for 0.5fl oz. This should be considered an elicit substance! For bulk-coating it works pretty well. For getting into detailed spaces it's not so great, at least not with the included brush. I already planned to overflow the glyphs and sand off the overflow. This did not work as expected. The paint really does seep into the ridges which meant sanding off all the overflow would require completely sanding down the surface of the body, at least around the glyphs. 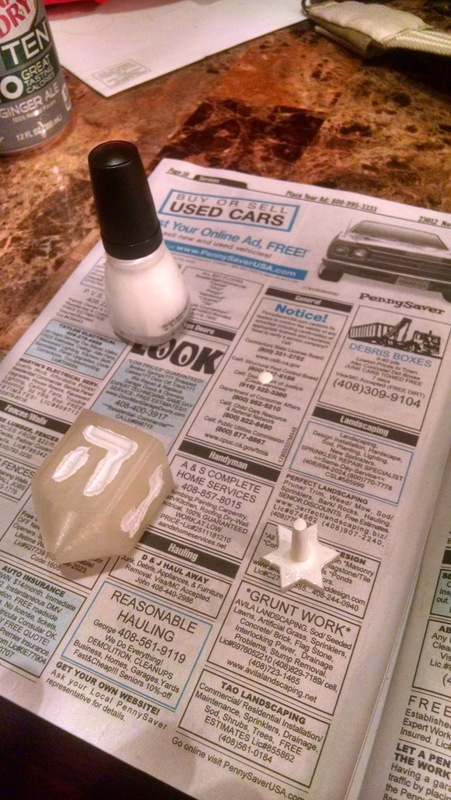 Oh well, it's white paint so adding color over it should be just fine. Sanded the overflow, kind of. It didn't quite. 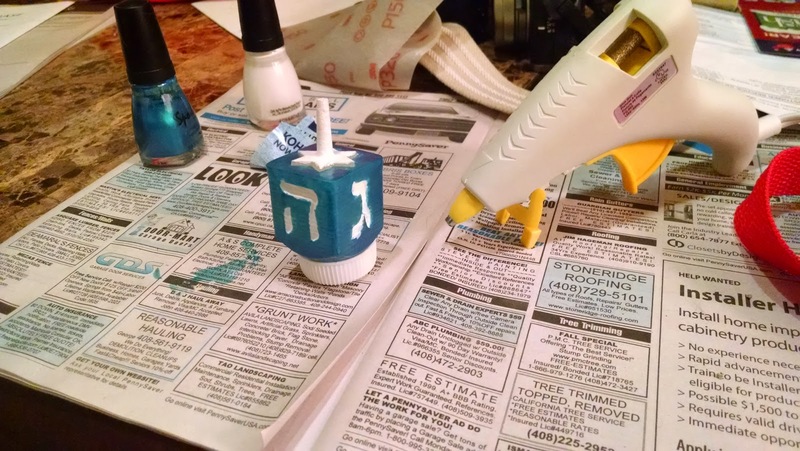 My blue paint was kind of a blue tint with fairly subtle sparkles. The white showed through easily but the sparkles were nice. This is where I see that this is intended to be going over nails and being translucent can make for a cool effect. In this case it is still kind of a cool effect because it smooths out the layering ridges while leaving them visible. This might be really neat for some projects. Even though the handle stays in easily through friction alone, I figure at some point I'm going to drop it, it will bang on something, and the handle will go shooting off, only to be found next time I move to a new home. 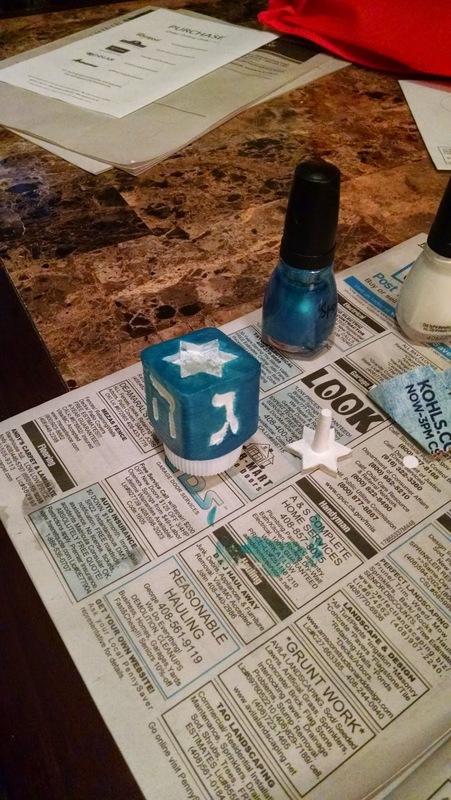 First coat of blue.. with sparkles! Ultimately I'm pretty pleased with the results. I'm kind of clumsy doing fine painting but I have virtual no practice and absolutely none recently. A couple of coats in, looking snazzy!